We are your number one resource for boat rental charters in PA, whether you're looking to fish or simply enjoy a relaxing day on the ocean. Take advantage of one of these great charter boats in Pennsylvania the next time you visit the state. "We find 'em, you wind 'em"
Charters leave out of Reel Chaos' home port of Forked River, NJ, just minutes from beautiful Barnegat Bay and Barnegat Inlet. This location allows them to fish many productive areas in both the North and South. From Manasquan Inlet to Little Egg Harbor, they cover all waters in between and around Long Beach Island (LBI). They now offer pick up and drop off on Long Beach Island (LBI) near the Barnegat Lighthouse. Captain Tom has been fishing Barnegat Bay and surrounding waters for over 30 years. 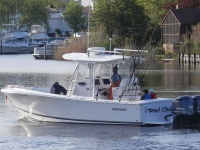 The 28 ft. vessel, Reel Chaos, is a 2014 Regulator Center Console with a full head. Whether inshore, offshore, sunset cruise past Barnegat Lighthouse or even your favorite waterfront restaurant, be assured that you and your family will reach your destination comfortably, safely and in style when you charter Reel Chaos. 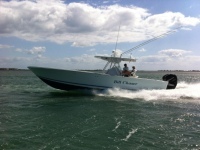 Captain Tom offers custom charters aboard Reel Chaos, the perfect boat for inshore or offshore fishing. He offers fishing trips for both the professional to the novice fishermen and for the youngest anglers in the area. Great Fishing Charter Boats in Pennsylvania! Enjoy hands-on fishing aboard the Seawolf Sport Fishing Charter on Lake Erie! The best part of it all? You do all the fishing! Each guest is provided with the proper bait and equipment, as well as instructions on how to catch fish in the lake. Fish for trophy walleye, smallmouth bass, steelhead trout, jumbo yellow perch, and others. All Seawolf boats are designed for extreme safety, and owned and operated by USCG licensed Captain Ron Rusch. 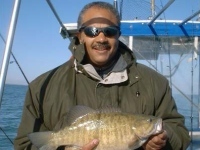 Captain Ron possesses over 31 years of experience, fishing on Lake Erie. Check the website for a list of affordable rates to rent each charter. Fishing Charter Boat off of Sandy Hook, NJ! Bill Chaser Sport fishing Charters offers private fishing charters on a daily basis! Bring your family and friends to Bill Chaser Sport fishing Charters and enjoy a fishing day trip on an uncrowded boat. You can chose a 1/2 day, 3/4 day, full day, even a 2 day fishing trip! April through May enjoy fishing for Winter Flounder, Striped Bass, Bluefish, Fluke, June through November fish for Fluke, Bluefish, Striped Bass, Weakfish. Bill Chaser Fishing Charters accommodates for all levels of fishers! Whether you've been sport fishing for years or it’s your first trip, Bill Chaser Fishing Charters will make sure you have a great time and make life long memories! Captain Don has been fishing the waters of Sandy Hook NJ and the Raritan Bay for over 12 years and knows the best spots to catch huge fish, no matter the season! Grab your family and friends for a fun and exciting fishing trip!